A GIFT FOR ALL OCCASIONS! 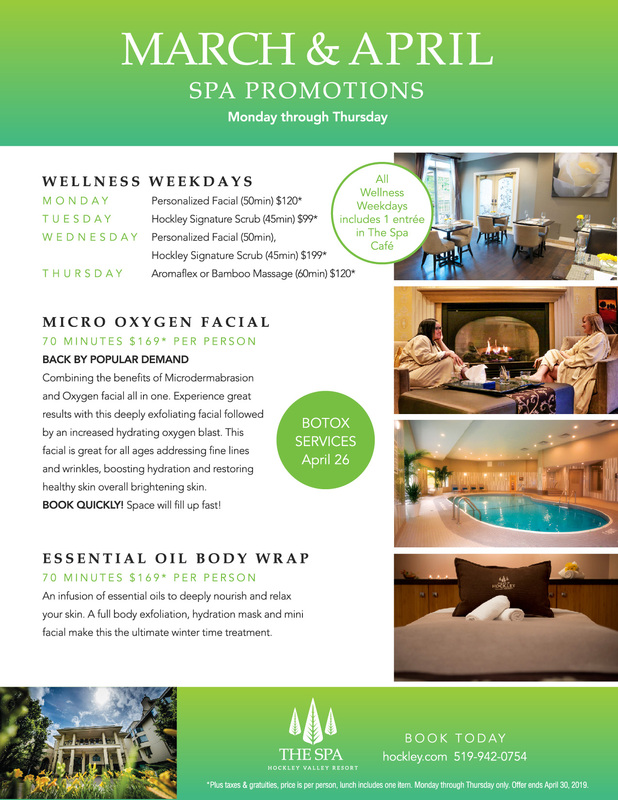 Hockley Valley spa gift cards are available for purchase for packages or in any dollar amount. We used the spa to host our annual retreatWe would never think of going anywhere else. When you get the best why go anywhere else? Amazing Spa Day“Hockley always does a great job at making it an extremely pleasurable experience… we love it here”. This exclusive, intensely rejuvenating treatment dramatically minimizes visible lines and wrinkles, with the combination of microdermabrasion or peel and collagen. Enjoy a more youthful, flawless appearance while indulging in relaxation with a scalp massage and hot stone foot treatment. Cost: $215 / Duration: 80 min. A five step treatment, with a unique oxygen complex and patented anti-microbial peptides combined with a light peel and oxygen blast to purify and deeply hydrate. Restore the skin’s natural radiance and glow. A popular choice with great results. Cost: $175 / Duration: 70 min. With the use of a highly controlled vacuum suction and minute crystals to create medium depth exfoliation, a micro facial will give a healthier glow, stimulate and increase collagen production, refine skin texture and improve skin colour. A treatment benefitting to all skin types and ages. Cost: $165 / Duration: 60 min. Renew tired, sun damaged, uneven skin and combat the signs of aging, fine lines and wrinkles with our all natural skincare line. Begin by preparing the skin with a deep exfoliation using sweet cherry enzyme, followed by a facial massage with hydrating essential oils and brightening Vitamin C algae mask to bring out that glowing skin. Cost: $150 / Duration: 60 min. An effective facial that helps promote exfoliation, remove dead skin cells, improve texture and reduce visible signs of aging. This clinical facial will brighten complexion and leave the skin feeling silky soft. Cost: $90 / Duration: 30 min. A completely customized skincare experience to meet your needs. With a deep cleansing and enzyme peel followed by extractions, facial massage and a final mask, your skin will feel relaxed and renewed. It’s the perfect choice for anyone looking for a custom facial, with great results. Cost: $130 / Duration: 50 min. area rich in youth activator fluid and hydration. Complete with a unique triple action cream to minimize the appearance of dark circles, puffiness, expression lines and wrinkles. *All services can be customized for Men. Add that extra touch to maximize your facial results-quick add-ons for any facial, personalizing for long-lasting results. NOTE: These services are combined with your facial and are not individual services on their own. All facials are listed above. wrinkles and under eye bags. Approved Uses: BOTOX® Cosmetic is a prescription medicine that is injected into muscles and used to temporarily improve the look of both moderate to severe crow’s feet lines and frown lines between the eyebrows in adults. Micro-needling is an advanced facial which activates hyaluronic acid and cell production, creating micro-channels to allow vitamins, minerals and vital nutrients to penetrate the skin. Micro-needling allows for the skin to heal, repair and rejuvenate. This actives type 1 collagen starting from your initial treatment. You won’t believe the results!!! Micro needling also targets wrinkles, hyper pigmentation, rosacea, scars and acne, and is great for all skin types.Makeup is not recommended for 38hrs after treatment.Collagen micro-needling treatments are recommended quarterly, and at home rolling is recommended every other night. Let’s ROLL in healthy skin! De-stress with this therapeutic Swedish style massage; relieves muscular pain and tension while enhancing flexibility and improving circulation. *Upgrade to a Deep Tissue for $5.00. *Performed by a Registered Massage therapist. This massage is in entitled to an insurance receipt. Cost $80 – 30 min. / $130 – 60 min. / $175 – 90 min. tendons and fascia to feel renewed. Prenatal massage is similar to the Hockley Spa massage – it aims to relax tense muscles, ease sore spots, improve circulation and mobility and make you feel good! Prenatal massage is also customized to the needs of pregnant women and their changing bodies, with the option of using a prenatal pillow, helping therapists trained in prenatal massage to adjust their techniques accordingly. Cost $85 – 30 min. / $135 – 60 min. you might just fall asleep! Cost $75 – 30 min. / $120 – 60 min. A massage that begins with a fantastic scalp massage and eases into massaging the neck and shoulders to release tension, flowing into a massage of the arms and hands. The feet enjoy a foot scrub, hot towel compress and a massage using hot stone. A great way to melt tension away. Cost $99 – 50 min. A relaxing scalp massage that incorporates our signature buriti oil that will leave the scalp and hair deeply hydrated. Seasonally inspired body whip used for a neck and shoulder massage leaving you feeling rejuvenated. Great for even the most sensitive skin types. Please be advised that massages paid for with a gift card are not eligible for an insurance receipt. Please see www.cmto.com for further details. This scalp massage puts you in the lap of luxury as your scalp, neck and shoulders are massaged with warm oils. This massage technique soothes, relaxes and nurtures your mind, body and spirit as the warmth of the healing oils penetrate your skin and scalp. An invigorating foot massage ends this treatment. Cost $70 – 30 min. Bring the best of two worlds into one treatment combining Reflexology and Aromatherapy. This treatment will leave you feeling renewed and refreshed; we begin with a scalp massage that leads to exfoliation of the feet, Reflexology is performed then followed by a full body massage with your choice of essential oils. Cost $125 – 60 min. / $150 – 90 min. A natural healing art based on the principle of reflex points on the head, hands and feet which correspond to every part, gland and organ of the body. This treatment begins with a scalp massage, followed by exfoliation of the feet and a hot towel compress. Through the application of pressure on these points the body’s natural balance and overall well-being is brought back into harmony. Cost $120 – 60 min. This healing treatment allows your body to experience a greater level of relaxation. Basalt stones are heated to perfection and gently placed on key parts of the body to maximize relaxation. The therapist then uses them as an extension of their hands; your body will absorb the waves of heat as it ascends into a state of total bliss. Cost $175 – 75 min. An invigorating and gentle sugar scrub infused with natural essential oils and hydrating oils leaving the skin silky smooth. Ending your experience with our signature body whip application. Ask for our seasonal scent. Cost: $99 / Duration: 45 min. A luxurious ritual enhanced with the organic essences of buriti oil, derived from the palm tree in Brazil known as the “tree of life.” This nourishing and detoxifying treatment involves a full body scrub, organic facial and relaxing application of buriti oil. Cost: $173 / Duration: 70 min. Add that extra touch to maximize your Body Treatment. These add-on services can be combined with any of the Body Treatments listed above. Personalized Facial – to take the mini facial to the next level and enjoy a fully customized facial. Enjoy a luxurious treatment for your hands including an exfoliation and re-hydrating mask, leaving the skin feeling silky smooth. Includes nail care and polish. Cost: $64 / Duration: 60 min. A decedent foot treatment that includes our locally sourced seasonal products. Our deeply exfoliating sugar scrub to aid in healing cracked dry skin followed by a hydrating foot mask. A hot stone massage stimulate your reflexes for overall relaxation. Cost: $79 / Duration: 60 min. Get fabulous looking nails with no chips or smudging. This dry manicure includes shaping, cuticle care and a hybrid polish gel application cured under LED light. Walk out the door with instantly dry beautiful nails. Cost: $54 / Duration: 50 min. *Please note that French polish is an additional $15 and must be booked in advance. A relaxing hand treatment including cuticle trimming, nail shaping, a moisturizing hand massage and polish application. A quick pick me up for the feet, involving nail and cuticle care, callous removal, cream and polish application for the final touch. That classic look of French polish may be what you’re looking for. This service needs to be booked in advance. A soft azulene wax, gentle enough for the most sensitive skin is used with the highest standards of hygiene to ensure your safety. Book a spa bridal party with us! 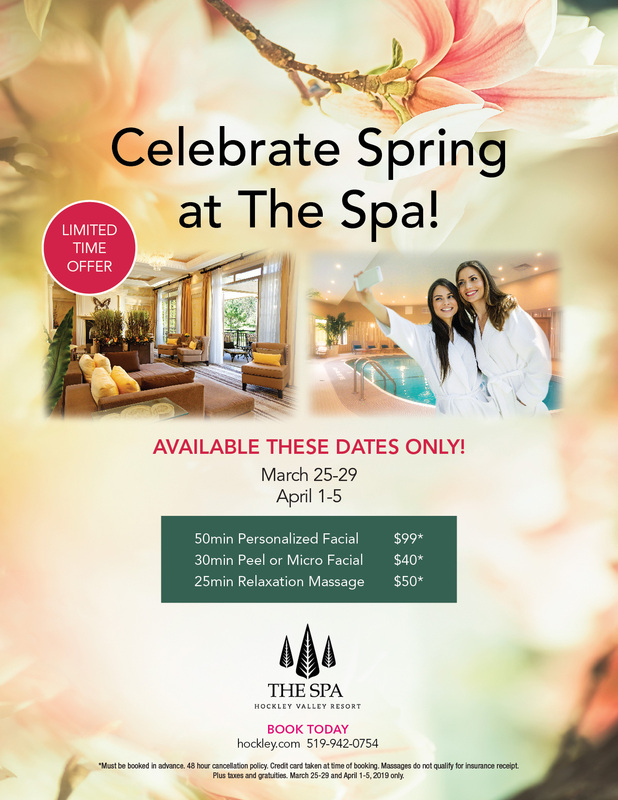 Immerse your bridal party and yourself in the luxury of our 8,000 square foot spa. *Includes complimentary glass of champagne. Complimentary French upgrade for the bride and maid/matron of honour. Please let reception know at time of booking for French application.Plus taxes and an automatic 15% gratuity. Massage does not qualify for insurance benefits. Please come with your hair washed and in a towel. * Must be booked in advanced. Stylists are only available upon request. 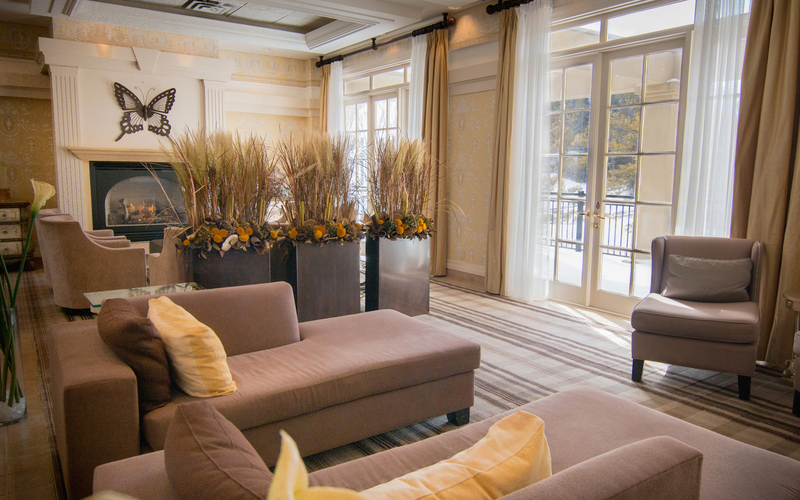 in a warm atmosphere, your getaway will provide you with great memories to share for years. *Plus taxes, gratuities and resort fees. Blackout dates may apply. Expires March 31, 2019. 25mar - 5aprAll DayCelebrate Spring at The Spa! *Must be booked in advance. 48 hour cancellation policy. Credit card taken at time of booking. Massages do not qualify for insurance receipt.Plus taxes and gratuities. March 25-29 and April 1-5, 2019 only. The Spa Cafe is nestled in the heart of our spa, featuring seasonal, farm-to-table fare. Enjoy a delicious lunch, glass of wine or smoothie from the comfort of your robe and make it a true spa getaway. In the summer months, enjoy the view from our patio, overlooking the outdoor pool. Please provide a minimum of 48 hours’ notice if you are unable to keep an appointment. Failure to do so will result in full payment for the scheduled service. Please arrive 20 minutes early for your appointment. For late arrivals, we cannot guarantee your full treatment time, your service will be altered due to starting late. We reserve the right to adjust service times up to 20 minutes due to unforeseen circumstances. We can not guarantee requests for male or female registered massage therapists. Changes to your spa service need to be made 48 hours prior to arrival and cannot be guaranteed. We offer spa guests access to our outdoor and indoor pools based on availability. Please shower before entering the pool.